Reading and share top 32 famous quotes and sayings about Problem Of Life by famous authors and people. Browse top 32 famous quotes and sayings about Problem Of Life by most favorite authors. 1. "A man needs his father more as life progresses, not less. It is not enough to learn how to use a lathe, milk a cow, repair a roof; there are greater holes to mend, deeper wells to fill, that only a father's wisdom can sustain. A father teaches his son how to think a problem through, how to lead a household, how to love his wife. A father sets an example for his son, building his character from the soul outward." 2. "We don't have a major problem right now in our country, and life is normal. Things like unemployment, which the youth are suffering from, and the rate of inflation - these are chronic conditions and we have to solve them." 3. "We have made a problem for ourselves by confusing the intelligible with the fixed. We think that making sense out of life is impossible unless the flow of events can somehow be fitted into a framework of rigid forms. To be meaningful, life must be understandable in terms of fixed ideas and laws, and these in turn must correspond to unchanging and eternal realities behind the shifting scene. But if this what "making sense out of life" means, we have set ourselves the impossible task of making fixity out of flux." 4. "If I were a tree among trees, a cat among animals, this life would have a meaning or rather this problem would not arise, for I should belong to this world. I should be this world to which I am opposed by my whole consciousness and my whole insistence upon familiarity. This ridiculous reason is what sets me in opposition to all creation. I cannot cross it out with a stroke of the pen"
5. "The real problem of life is never a lack of time. The real problem of life - in my life - is lack of thanksgiving." 6. "Jesus embraced His not enough ... 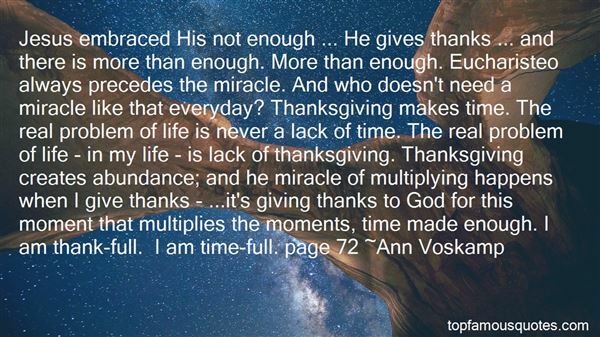 He gives thanks ... and there is more than enough. More than enough. Eucharisteo always precedes the miracle. And who doesn't need a miracle like that everyday? Thanksgiving makes time. The real problem of life is never a lack of time. 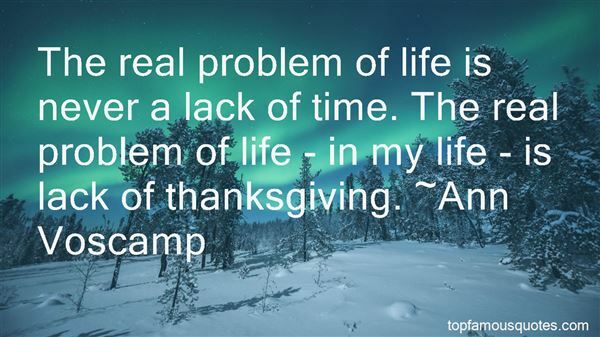 The real problem of life - in my life - is lack of thanksgiving. Thanksgiving creates abundance; and he miracle of multiplying happens when I give thanks - ...it's giving thanks to God for this moment that multiplies the moments, time made enough. I am thank-full. I am time-full. page 72"
7. "Don't try to make life a mathematics problem with yourself in the center and everything coming out equal. When you're good, bad things can still happen. And if you're bad, you can still be lucky." 8. "I have treated many hundreds of patients. Among those in the second half of life - that is to say, over 35 - there has not been one whose problem in the last resort was not that of finding a religious outlook on life. It is safe to say that every one of them fell ill because he had lost that which the living religions of every age have given their followers, and none of them has really been healed who did not regain his religious outlook." 9. "In my opinion, a problem derails your life and an inconvenience is not being able to get a nice seat on the un-derailed train." 10. "Pain is a relatively objective, physical phenomenon; suffering is our psychological resistance to what happens. Events may create physical pain, but they do not in themselves create suffering. Resistance creates suffering. Stress happens when your mind resists what is... The only problem in your life is your mind's resistance to life as it unfolds." 11. "This was the thing that terrified me the most - more than the victim, more than the demon, more even than the dark thoughts. It was the fact that the dark thoughts were mine. That I couldn't separate myself from evil, because most of the evil in my life came from inside my own head.How long could I live like this? I was trying to be two people - a killer on the inside, and a normal person on the outside. I made such a show of being a good, quiet kid, who never caused problem and never got into trouble, but now the monster was out, and I was actually using him - I was actively seeking out another killer. I'd given in. I was trying to be John and Mr. Monster at the same time.Was I fooling myself, thinking that I could split my life like this? Was it possible to be two people, one good and one bad, or was I forced to be a mix of both - a good person forever tainted by evil?" 12. "We sat looking out at the ocean. There was just so much of it, and it never failed to take my breath away. Looking at the ocean gave me the same sensation I'd get staring at a sky full of stars- that I was small. Like the way a math problem reveals its undeniable truth, I knew when I stared into this sort of endlessness that my life didn't count for much of anything. And knowing that, that I was nothing but a speck, I felt pretty lucky for all that I had." 13. "During the spring break I read a book called Everlasting. It was a really great book to read. It was about how a girl named Ivy and a boy named Triston were madly in loved but they couldn't be together. Triston had died but he came back to life as another person. But, the problem was that the person that he become was accused as a murderer. So he was being chased. But, even though he was being chased they figured things out and they were together forever. I chose to read this book because when I first started reading it i really liked it. I liked this book a lot because it talked about romance and how they didn't give up. They overcame the difficulties that came before them. What I didn't really like about this book is that many people came in between the love that Ivy and Triston had." 14. "It could be enough, maybe, or at least a start, but the problem is that at night I tumble into dreams that aren't dreams at all. I tumble into memories and wake up aching for a dying world and a quiet, cold life that offered me nothing but sitting in a still room." 15. "It's amazing to me that we live in such a wonderful country where anyone can have a problem in life and get up, dust themselves off and start all over again." 16. "The problem in public life is learning to overcome terror; the problem in married life is learning to overcome boredom." 17. "To her amazement, she realized that the way of life of these people was nothing more than an indeterminate fiction, casually knotted together at particular points that were used again and again. With four or five remarks, and a couple of facial expressions, she had mastered it with no problem at all." 18. "Unsure how to answer, I took another grape. Time was no problem for me, but I wasn't eager to hear the long life story of a dwarf. And besides, this was a dream. It could evaporate any moment." 19. "I do believe in simplicity. It is astonishing as well as sad, how many trivial affairs even the wisest thinks he must attend to in a day; how singular an affair he thinks he must omit. When the mathematician would solve a difficult problem, he first frees the equation of all incumbrances, and reduces it to its simplest terms. 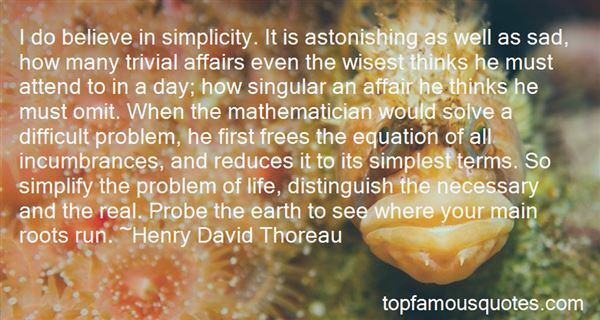 So simplify the problem of life, distinguish the necessary and the real. Probe the earth to see where your main roots run." 20. "Savoir souffrir sans se plaindre, ça c‘est la seule chose pratique, c‘est la grande science, la leçon à apprendre, la solution du problème de la vie. [Knowing how to suffer without complaining is the only practical thing, it's the great science, the lesson to learn, the solution to the problem of life.]" 21. "Come on," Alec said, already stomping down the ramp. "Let's find us a squirrel." He swept the weapon back and forth as he walked, looking for any interlopers. "Or better yet, one of the crazies who might've strayed over here. Too bad these things have to be charged or we could get rid of this virus problem in a jiffy. Sweep these old neighborhoods nice and clean. "Mark joined him on the ground below the Berg, wary that someone might be watching from the ruined homes surrounding them or from the burnt woods beyond those. "Your value of human life brings tears to my eyes," he muttered." 22. "My life would nevercontain a convenient, pain-saving planwhen it could stretch a problem out intoan endless agony of uncertainty andtorture." 23. "It may be that everything the life science companies are telling us will turn out to be right, and there's no problem here whatsoever. That defies logic." 24. "In Shahid's view, the best way through difficult times, as through life in general, was just to go along with things. It was a rare problem that couldn't be solved by being ignored." 25. "In life I Have learned a lot of things, One of the main things I learned is that If you waste your time with problem women you will end up with nothing but women problems"
26. "It was long before I could believe that human learning had no clear answer to this question. For a long time it seemed to me, as I listened to the gravity and seriousness wherewith Science affirmed its positions on matters unconnected with the problem of life, that I must have misunderstood something. For a long time I was timid in the presence in learning, and I fancied that the insufficiency of the answers which I received was not its fault, but was owing to my own gross ignorance, but this thing was not a joke or a pastime with me, but the business of my life, and I was at last forced, willy-nilly, to the conclusion that these questions of mine were the only legitimate questions underlying all knowledge, and that it was not I that was in fault in putting them, but science in pretending to have an answer for them." 27. "But life wasn't a fairy tale, and I had no problem doing what was necessary to get what I wanted, even if it meant playing dirty." 28. "And if life be, as it surely is, a problem to me, I am no less a problem to life." 29. "You don't seem mad at all,' she said.But I am, although I'm undergoing a cure, because my problem is that I lack a particular chemical. However, while I hope that the chemical gets rid of my chronic depression, I want to continue being mad, living life the way I dream it, and not the way other people want it to be. Do you know what exists out there, beyond the walls of Villete?" 30. "When I was a much younger man, say around twenty-five or thereabouts, I never gave much thought to what my life would be like as an older man. Part of that problem is that I'm a card-carrying member of the Baby Boomer generation, and like most of my jeans wearing, music loving, Woodstock-era free spirits, we are trapped in a bizarre world where everybody else looks and grows older yet somehow, miraculously, age will take a pass on us." 31. "I fracked over 3,000 wells in my life and never had a problem with an aquifer." 32. "The relative ease of most driving lures us into thinking we can get away with doing other things. Indeed, those other things, like listening to the radio, can help when driving itself is threatening to cause fatigue. But we buy into the myth of multitasking with little actual knowledge of how much we can really add in or, as with the television news, how much we are missing. As the inner life of the driver begins to come into focus, it is becoming clear not only that distraction is the single biggest problem on the road but that we have little concept of just how distracted we are." I'm more cerebral than I want to be."